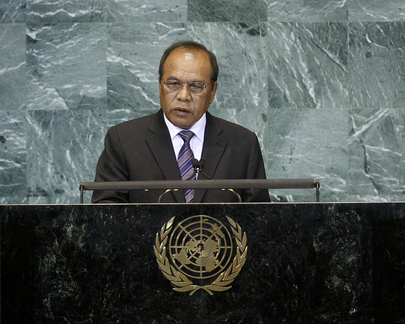 JURELANG ZEDKAIA, President of the Marshall Islands, reminded the Assembly of the need to take global action on climate change. “We have no mountains or high ground – we have only our narrow archipelago resting metres above the ocean,” he said, noting there had been enough talk “and too much repetition for meaningful action”. Failure to address the various impacts of the phenomenon in the short-term would mean economic and moral costs for all low-lying islands and beyond. The global commitment to safeguard the most vulnerable faced a true litmus test, and he urged that, by the upcoming Cancun meeting of the States parties to the United Nations Framework Convention on Climate Change, nations build political trust through “fast start” finance. In that regard, his Government had endorsed a new climate road map that spelled out actions to cut emissions by 40 per cent by 2020, among other strategies. In addition, the Marshall Islands had made relevant inroads towards achieving its Millennium Development Goals, but much remained to be accomplished. Practical and “shovel ready” adaptation measures, including water security, resource conservation and infrastructure protection, would sharply reduce the long-term risk to its security and sovereignty. Such threats could not be ignored and the political rights to its land must be safeguarded if the thin water table became unusable because of rising seas. The Marshall Islands was considered a small island developing State but was first and foremost a large ocean nation. As Chair of the Parties to the Nauru Agreement, he noted that he was also addressing delegations on behalf of the Western and Central Pacific countries bound together to ensure the protection of the world’s largest viable tuna fishery. Inertia regarding overfishing had strangled the region’s development and threatened the viability of resources. For its part, the Marshall Islands Government had and would continue to close surrounding pockets of international waters if the ecosystem remained threatened. He said the Marshall Islands realized only a tiny fraction of a multibillion industry – one penny from each can of Pacific tuna – and the Government was seeking political support and economic partnerships to grow its benefit. Without such cooperation and if fishing targets remained out of line with science, the Parties to the Nauru Agreement were certain that their economic development would remain at a standstill as its coastal resources decline. Therefore, greater efforts were needed from both United Nations agencies and regional fisheries management organizations, he added. Reiterating the need to reform the Security Council, he called for an enlargement of that body to accommodate nations whose size, leadership and responsibility - in particular the “G-4” of Japan, Germany, India and Brazil - deserved a role as permanent members. Further efforts should also ensure that Africa and small nations and States had an improved voice.